Experior Laboratories is a trusted, independent, testing and qualification laboratory that maintains the overall accreditation, specific industry certifications and third-party approvals required to serve key manufacturers in telecom, datacom, military, aerospace and industrial markets. 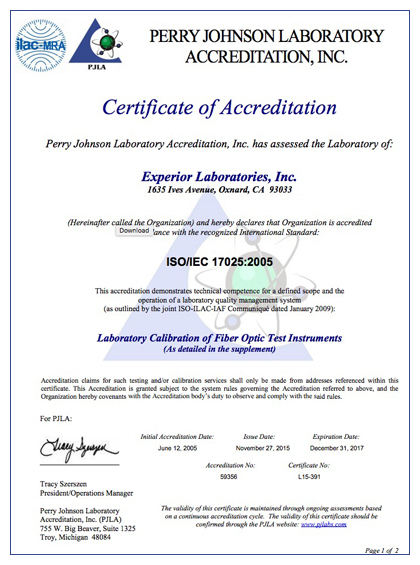 Experior Laboratories’ management system, quality manual and quality standards for customer care and technical service are independently accredited to ISO/IEC-17025:2005 and are compliant with international standards requirements as outlined by the International Organization for Standardization (ISO). ISO/IEC 17025 specifies the general requirements for the competence to carry out tests and calibrations, including sampling. It covers testing and calibration using standard methods, non-standard methods and laboratory-developed methods. It applies to all organizations that perform tests and/or calibrations including first-, second- and third-party laboratories, as well as laboratories where testing and/or calibration are part of the inspection and product certification. Experior Laboratories is uniquely accredited for both “testing” AND “calibration” under the ISO/IEC-17025:2005 standard. This signifies that Experior Labs meets the stringent requirements of international quality standards for testing and calibration, reinforcing a deep commitment to quality and accuracy. The ISO/IEC-17025 accreditation extends to key parts of the Experior Labs organization. Experior Labs calibration services also comply with ANSI/NCSL Z 540-1 and measurement uncertainty per ANSI/NCSL Z 540-II.